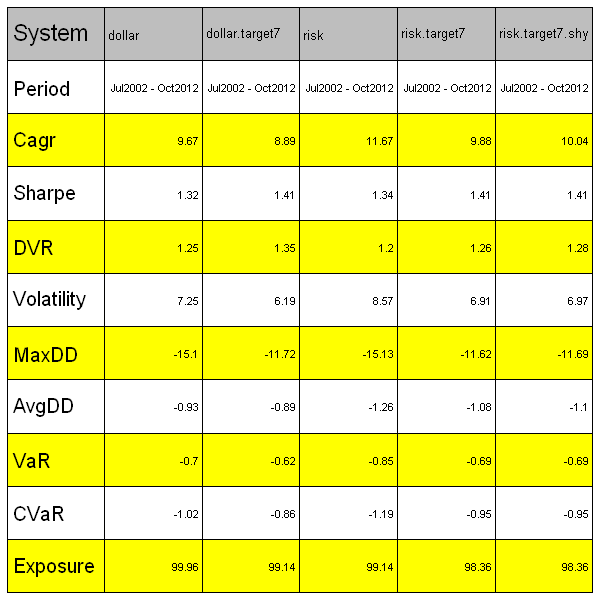 I came across the link to the John Ehlers paper: Predictive Indicators for Effective Trading Strategies, while reading the Dekalog Blog. John Ehlers offers a different way to smooth prices and incorporate the new filter into the oscillator construction. Fortunately, the EasyLanguage code was also provided and i was able to translate it into R.
Following are some results from the paper and test of John’s stochastic oscillator. 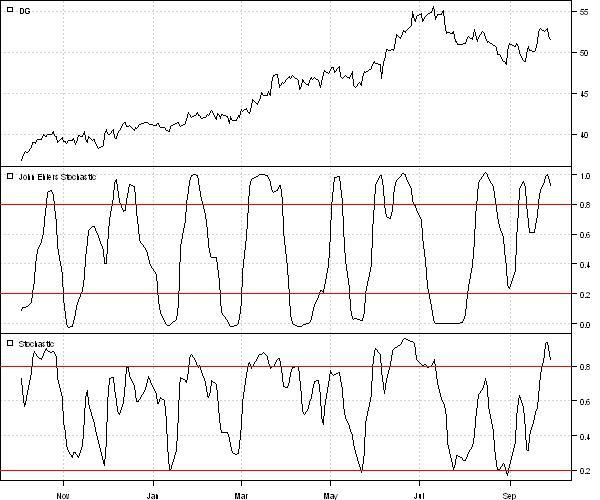 First let’s plot the John’s stochastic oscillator vs traditional one. Look’s like most profit comes from the long side. 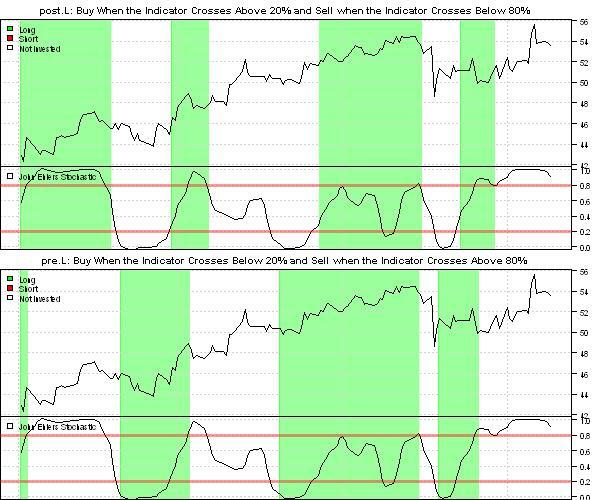 As a homework, I encourage you to compare trading the John’s stochastic oscillator vs traditional one. To view the complete source code for this example, please have a look at the john.ehlers.filter.test() function in bt.test.r at github. 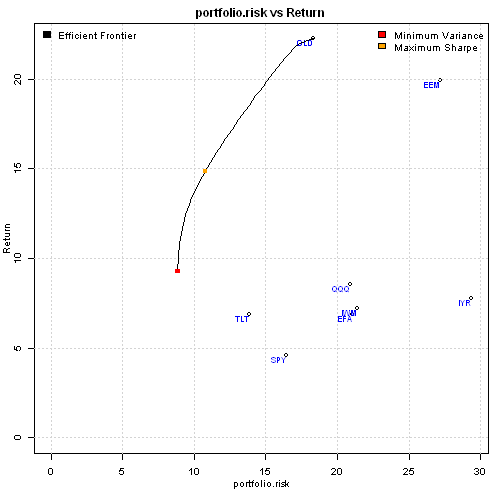 Maximum Sharpe Portfolio or Tangency Portfolio is a portfolio on the efficient frontier at the point where line drawn from the point (0, risk-free rate) is tangent to the efficient frontier. 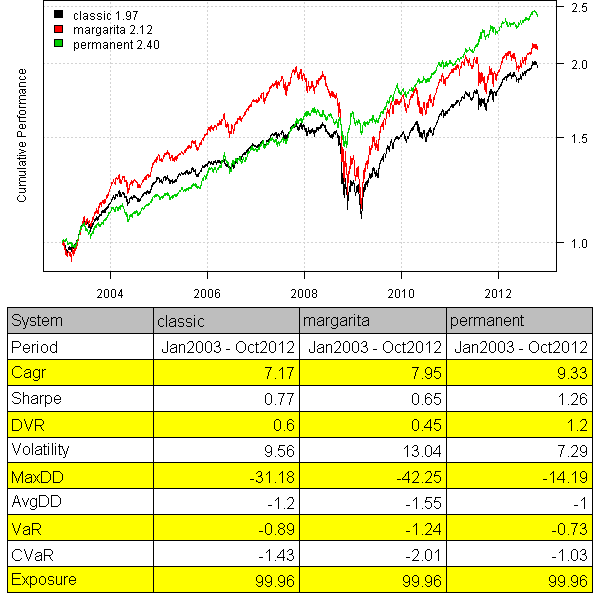 There is a great discussion about Maximum Sharpe Portfolio or Tangency Portfolio at quadprog optimization question. In general case, finding the Maximum Sharpe Portfolio requires a non-linear solver because we want to find portfolio weights w to maximize w' mu / sqrt( w' V w ) (i.e. Sharpe Ratio is a non-linear function of w). But as discussed in the quadprog optimization question, there are special cases when we can use quadratic solver to find Maximum Sharpe Portfolio. As long as all constraints are homogeneous of degree 0 (i.e. if we multiply w by a number, the constraint is unchanged – for example, w1 > 0 is equivalent to 5*w1 > 5*0), the quadratic solver can be used to find Maximum Sharpe Portfolio or Tangency Portfolio. Now, let’s construct a sample efficient frontier and plot Maximum Sharpe Portfolio. 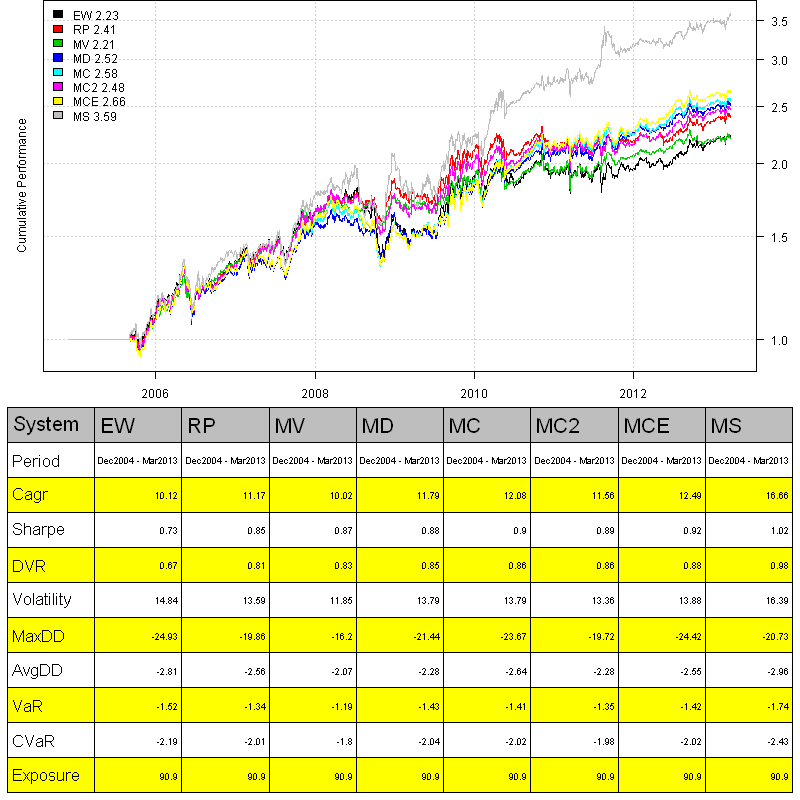 The long-only Maximum Sharpe portfolio as expected has exposure of 100%. 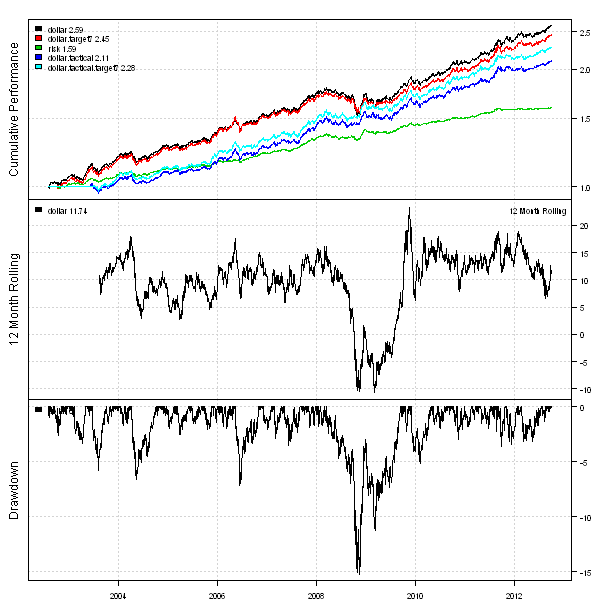 The long-short Maximum Sharpe portfolio is 227% long and 127% short. 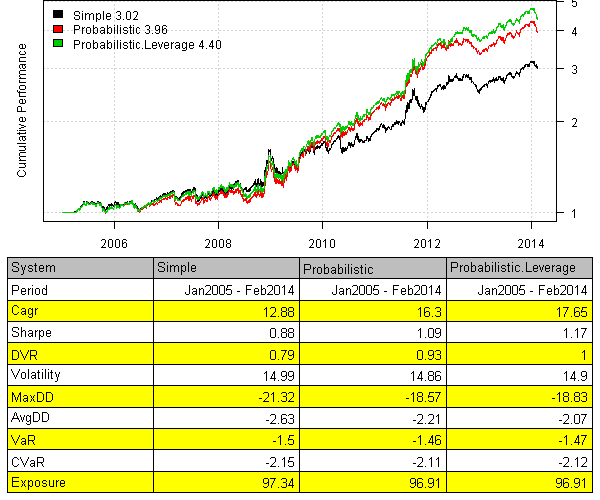 The market-neutral Maximum Sharpe portfolio is 100% long and 100% short. 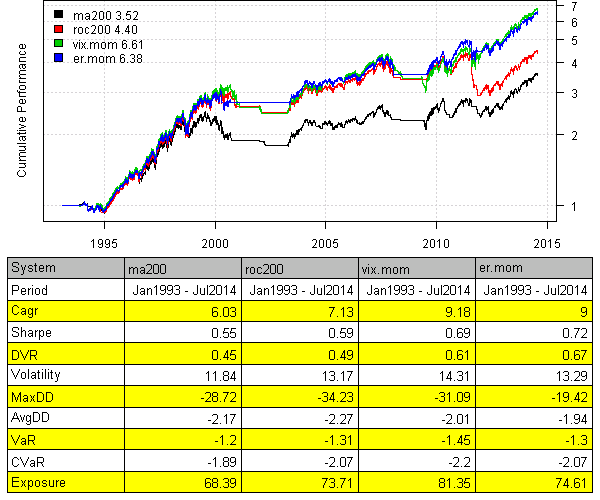 As the last step, I run Maximum Sharpe algo vs other portfolio optimization methods I have previously discussed (i.e. 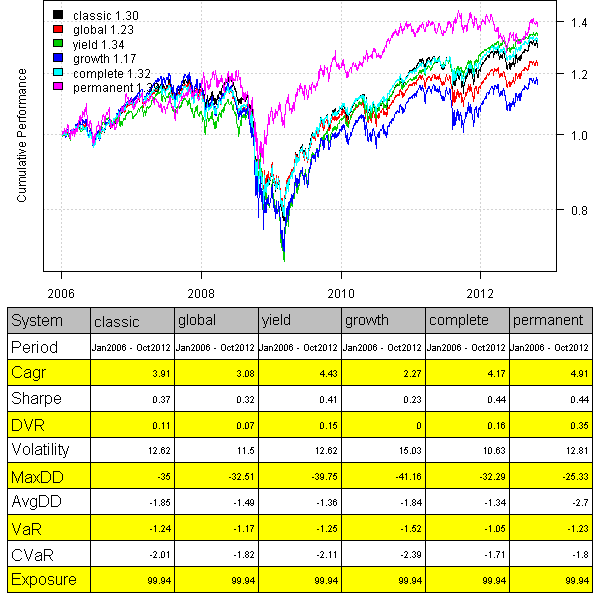 Risk Parity, Minimum Variance, Maximum Diversification, Minimum Correlation) on the 10 asset universe used in the Adaptive Asset Allocation post. The allocation using Maximum Sharpe Portfolio produced more concentrated portfolios with higher total return, higher Sharpe ratio, and higher turnover. I first read about the Couch Potato strategy in the MoneySense magazine. I liked this simple strategy because it was easy to understand and easy to manage. The Couch Potato strategy is similar to the Permanent Portfolio strategy that I have analyzed previously. 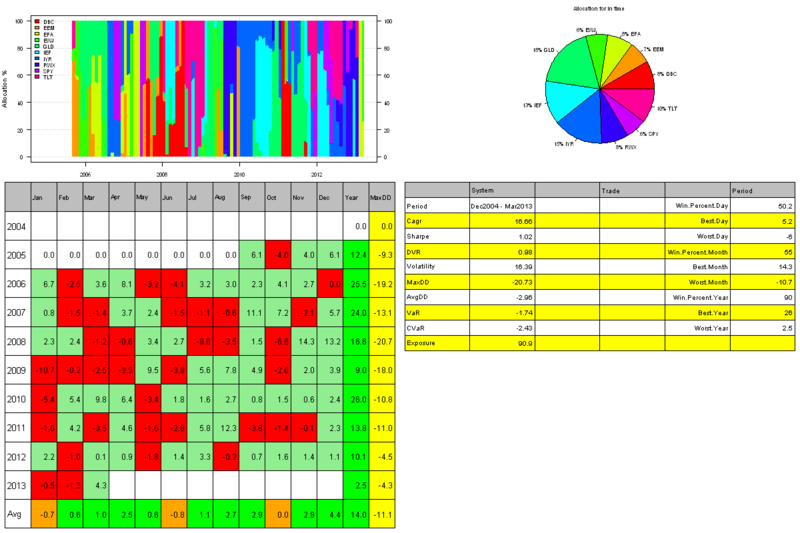 Today, I want to show how you can model and monitor the Couch Potato strategy with the Systematic Investor Toolbox. The couch.potato.strategy() function creates a periodically rebalanced portfolio for given static allocation. 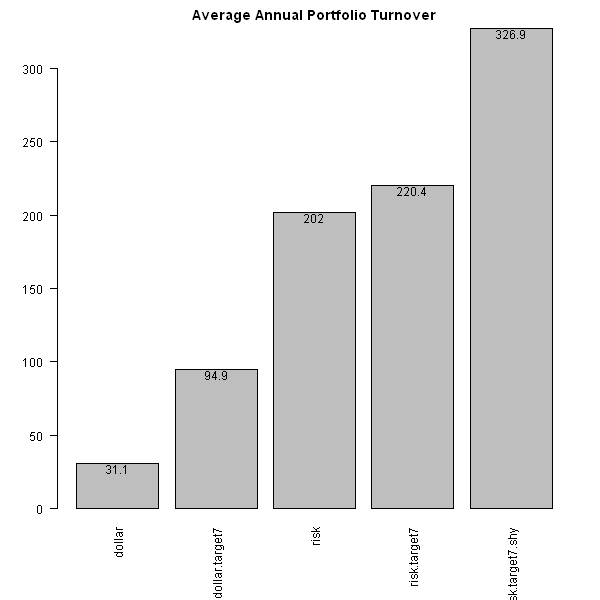 I have included a few classic Couch Potato portfolios and the Canadian version of the Permanent portfolio. The equity curves speak for themselves: you can call them by the fancy names, but in the end all variations of the Couch Potato portfolios performed similar and suffered a huge draw-down during 2008. The Permanent portfolio did a little better during 2008 bear market. 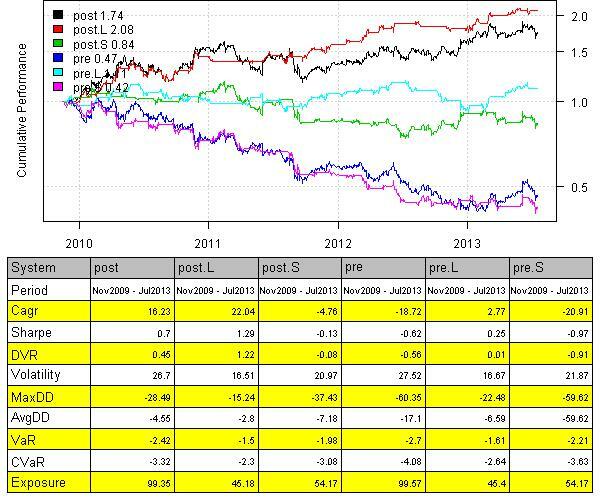 The US Couch Potato portfolios also suffered huge draw-downs during 2008. 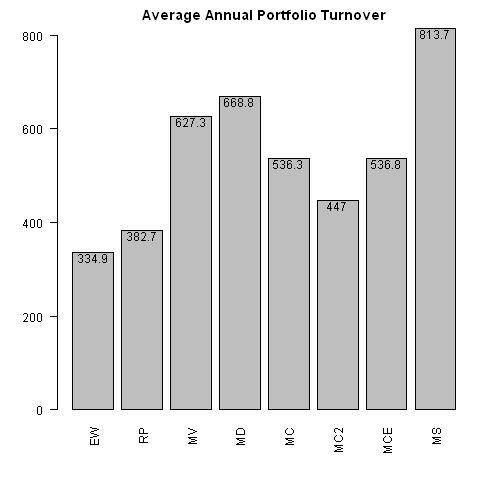 The Permanent portfolio hold it ground much better. It has been written quite a lot about Couch Potato strategy, but looking at different variations I cannot really see much difference in terms of perfromance or draw-downs. Probably that is why in the last few years, I have seen the creation of many new ETFs to address that in one way or another. For example, now we have tactical asset allocation ETFs, minimum volatility ETFs, income ETFs with covered calls overlays. To view the complete source code for this example, please have a look at the bt.couch.potato.test() function in bt.test.r at github. The second point is a bit more work. 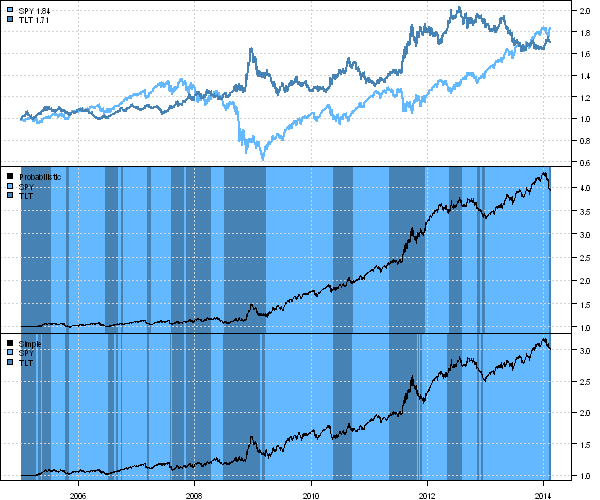 First, let’s allocate risk across only to 3 asset classes: stocks(SPY), gold(GLD), and treasuries(TLT). Next, let’s scale the SPY/GLD/TLT portfolio to the 7% target volatility. And finally, let’s allocate to cash(SHY) the residual portfolio exposure. The modified version of risk allocation portfolio performs well relative to other portfolios even after incorporating the 10c transaction cost. To view the complete source code for this example, please have a look at the bt.permanent.portfolio3.test() function in bt.test.r at github. First, let’s load the historical prices for the stocks(SPY), gold(GLD), treasuries(TLT), and cash(SHY) and create a quarterly rebalanced Permanent Portfolio strategy using the Systematic Investor Toolbox. Now let’s create a version of the Permanent Portfolio strategy that targets the 7% annual volatility based on the 21 day look back period. Please note that allocating equal dollar amounts to each investment puts more risk allocation to the risky assets. If we want to distribute risk budget equally across all assets we can consider a portfolio based on the equal risk allocation instead of equal capital (dollar) allocation. We can also use market filter, for example a 10 month moving average, to control portfolio drawdowns. 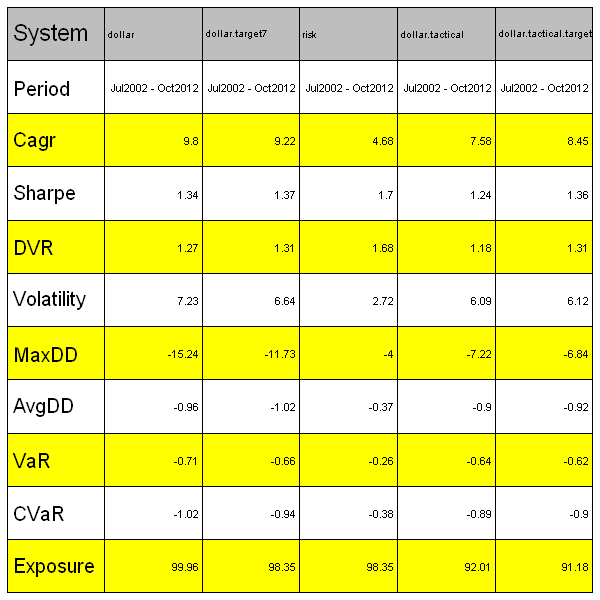 The final portfolio that combines market filter and volatility targeting is a big step up from the original Permanent Portfolio strategy: the returns are a bit down, but draw-downs are cut in half. To view the complete source code for this example, please have a look at the bt.permanent.portfolio2.test() function in bt.test.r at github.